Brandon Wimbush made his college debut last week. After a successful college debut last week, could true freshman Brandon Wimbush turn into more than just a backup quarterback for Notre Dame? Fighting Irish coach Brian Kelly said yes this week. 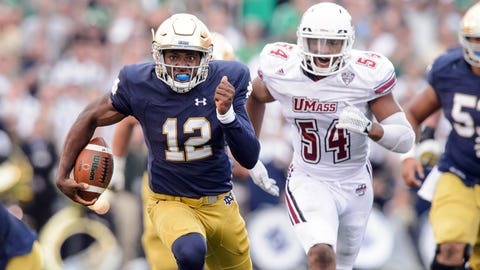 Wimbush appeared to be headed toward a redshirt when the season began, but a season-ending injury to Malik Zaire elevated DeShone Kizer to the starting role and made Wimbush the backup. He introduced himself to the college football world with a 58-yard touchdown run last week against Massachusetts. Kizer, a 6-foot-4.25, 230-pound redshirt freshman, has performed well as the new starter, but Kelly admitted the 6-1, 216-pound Wimbush brings some different things to the table. “He certainly doesn't have the whole playbook down at this point, but I think I'm moving more towards fine tuning some things that could get him in for the games regardless of the situation,” Kelly said. For his part, Kizer said the pair has a good relationship off the field. As Kizer is also learning himself, the key to success at the college level can sometimes simply be confidence.